The Imaam Should be Followed. If the Imaam Sits Down and Prays Then The Congregation Should Do The Same. Imaam Maalik is not a mudallis, refer to my book al-Fath ul-Mubeen (1/22 pg.27). Transmitted by Bukharee (no.689) and Muslim (79/411) from the hadeeth of Malik. It is obligatory to pray whilst standing unless there is a valid excuse legislated in the Sharee’ah. The Imam should be followed in the bowing (ruku), prostration (sujood) and in the general actions of the prayer unless there is a clear proof for the difference. For example it is not obligatory for the person who comes late to follow the Imams salutation at the end of the prayer. The Messenger of Allah (Sallalahu Alayhee Was-Sallam) did not have knowledge of the unseen, otherwise why would he have mounted a horse he was destined to fall from? The Messenger of Allah (Sallalahu Alayhee Was-Sallam) was not the remover of difficulties because if he was, he would never have fallen into difficulty himself by falling of the horse. It is Sunnah to teach the Qur’aan and Sunnah (hadeeth) after the prayer. Whenever the imam has to sit and pray due to a valid reason then the congregation should also sit and pray. Some scholars consider this hadeeth to be abrogated however other scholars do not. Jabir ibn Abdullah (RadhiAllaahu Anhu) is the narrator of the hadeeth which states when the Imaam sits and prays then you should also sit and pray. (Saheeh Muslim (no. 413), Dar us-Salam (numbering) (no.928). Once Jabir (RadhiAllaahu Anhu) sat down and prayed due to an illness and the congregation also sat and prayed behind him. (Mussanaf Ibn Abee Shaybah (4/326 no.7137) and its chain is [Sahih] authentic. Ibn Hajr also authenticated it in Fath ul-Bari (2/176) under hadeeth (no.689). From this we find the claim of abrogation is incorrect. Usayd Ibn Hudhayr (RadhiAllaahu Anhu) during his illness led the prayer whilst sitting down and he also instructed the congregation to pray whilst sitting, so they sat and prayed. 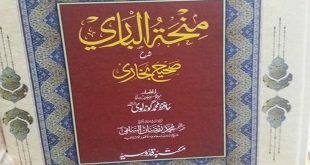 (al-Awsath of Ibn al-Mundhir (4/206 [Athar] no.2045) and its chain is [Saheeh] authentic. Hafidh Ibn Hajr authenticated it in Fath ul-Bari (2/176). Abdur Razzaq Ibn Hummam as-Sana’ani said this is what I found the people practising that when the Imaam would sit they would also sit and pray. (Mussanaf Abdur Razzaq (2/463 hadeeth no.4089). According to the opinion of Ahmad bin Hanbal and Ishaaq ibn Rahawaihah if the Imaam sits and leads the prayer then the congregation should also sit and pray behind him. 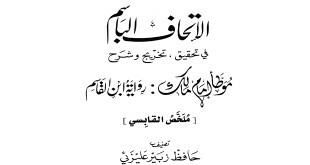 (Masaa’il al-Imaam Ahmad and Ishaaq Ibn Rahawaihah via Ishaaq Ibn Mansur al-Kawsaj (no.348), Sunan at-Tirmidhee (no.361). This is also the opinion of one group from amongst the Ahlul Hadeeth. 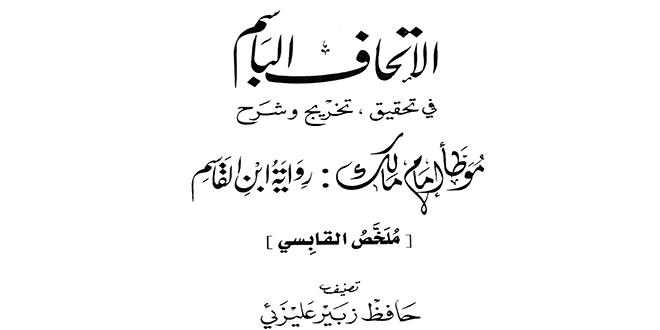 (al-Eitibaar Fee Bayan an-Nasikh Wal-Mansukh Minal Aathar of al-Hazimi (pg.111). It is established from the hadeeth which mentions the illness whereby the Prophet (Sallalahu Alayhee Was-sallam) passed away with, that if an Imaam leads the prayer and the people are standing and praying and then the first Imaam comes and prays whilst sitting down then the people will continue to stand and pray. This specific incident does not abrogate the hadeeth of Anas (RadhiAllaahu Anhu). This book ‘al-ittihaaf ul-Baasim Fee Tahqeeq Muwatta al-Imaam Malik [Talkhees al-Qaabisi] Riwaayah Abdur Rahman bin al-Qaasim’ has been presented with an understanding in conjunction with scholastic and benefits of academic research so that this understanding of the Qur’aan and hadeeth opens up the mean and path to research and actions. Wal Hamdullilah. the arabic text is in the opposite arrangement please check. sorry brother we are not quite sure what you are referring to exactly.